At the end of #1, Ella found herself in need of a new place to live after the apartment building she was in burnt down. So she hooks up with a group of alternative co-op farmers. Not a lot happens in this issue, but we begin to get an idea of what life is really like in Post-Rapture America. How do people get fresh food when civilisation goes belly up? Along what lines do you ally your self when the previous structures are no more? The more I look at it, the more I love Shannon Gerard’s art. It’s not your typical western superhero style comic art. It has this loose, timeless feel that I’m finding more and more to be mesmerising. I wouldn’t have thought it would be to my tastes, but I’m glad to see I was wrong. The interesting feature you get with these daily pages is the added bonus of creator commentary. Both the writer and artist contribute their thoughts on each page as the go. It’s fascinating to here Gerard’s thoughts on the art as the characters grow and develop and she grows as an artist (I’m taking a guess at Gerard’s gender. If I’ve got it wrong, I apologise profusely). There is one scene where the collective sit down for dinner. One of the characters mentions God. Another character replies that God had nothing to do with it. It’s a logical thought for a group of characters who believe that they and the rest of creation have been left behind by God while his chosen have ascended into heaven. This is a world that has reason to believe that God does not care for them. But in our world, we have a God who does love and care for us. Who does provide for us our every need. It is right and proper for us to thank God for our daily food. Because he is the one who gives it to us. 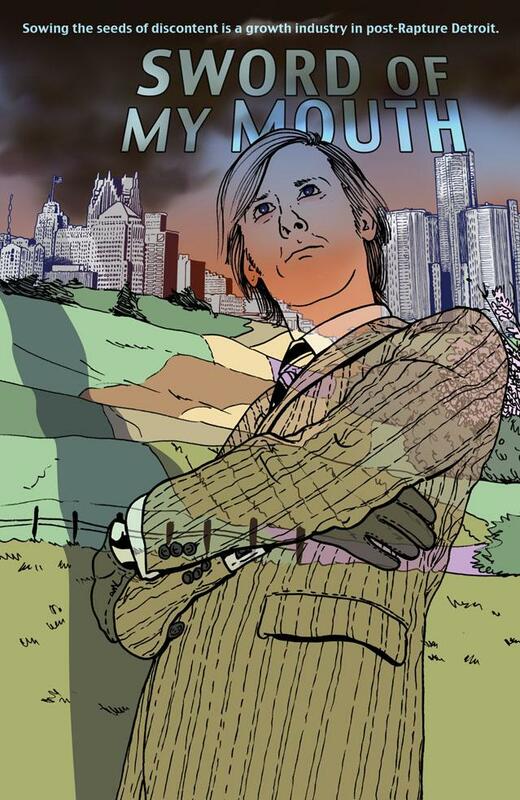 If you’re keen to read Sword of My Mouth, head over here to find out about subscriptions.